The Internet has made it easier to discover new music. This is actually not limited to music as it is also possible to find new book authors and books, video games or movies that you have never heard before. We are concentrating the discovery in this report on music, more specifically music from artists that the majority of users has never heard about. Update: Muzic is no longer available. Muzic scans the Internet and in particular blogs for free music that it then lists on the service's website. The majority of music that is found this way has been produced by new bands but the occasional promo of established bands (Black Sabbath or Queens of the Stone age for instance) appears in the results as well. This alone would be useful to discover music blogs that post information about artists and mp3 samples of their work. The artists and songs that are listed on the homepage of the service do reveal little information. The blog posts usually state the artist name, name of the free song and the genre. Most of the links lead to the blog the music was posted on. It is there that you find a download link pointing to one or multiple mp3s of the artist(s) that have been reviewed there. These blog posts usually contain a review of the song or artist. But Muzic does not only display what is posted at other blogs on their own page. More important than that is probably the search and categorization of music and artists. 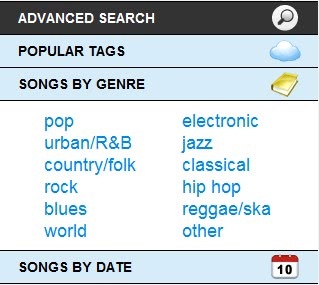 It is for instance possible to display popular tags, songs by genre or data. The advanced search on the other hand can be used to search for specific songs, artists, blogs or in all information at once. The results on the other hand look like the homepage listings. But that is more than sufficient and adds to the excitement of discovery. It is probably a good idea to look at specific genres to find music that you are interested in. All mp3 songs can be downloaded to the local computer system, this can accumulate to more than one hundred Megabytes of music per day if the blog links are followed as well. Muzic offers a great and comfortable way of discovering new music that is being uploaded and reviewed on the Internet. An RSS feed is available to subscribe to the site and be informed about new discoveries more easily. Muzic is a music discovery service that scans the Internet and in particular blogs for free music that it then lists on the service's website.